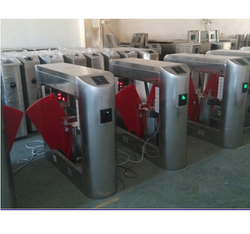 Leading Exporter of flap barrier, flap barrier gate, swing barrier, speed gate, flap barrier repairing service and automatic flab barrier service from Chennai. 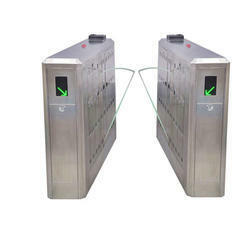 Automatic Flap Barrier Flap Barriers are well adopted in entrances and exits of buildings, malls, office, factories, institute and all commercial buildings, to help tracking staffs and visitors. Only authorized users are able to access to specific areas through the flap barriers. Lights on the barriers are to indicate status of the flap barriers. Steady green lights indicate locked barriers. Blinking green lights indicate accessible barriers. Automatic Swing Barrier The swing barrier system has compact and various housing designs suitable for different building entrances. It can be electrically or mechanically operated. The swing barrier comes with geared motor, electronic control and safety sensors to form a smooth and safe operation for access control. 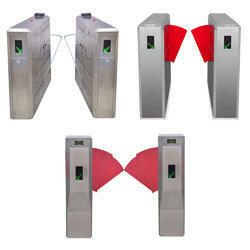 It is widely used in places like factories, commercial buildings, Zoos, Custom Check-points, Gardens, Shopping malls. 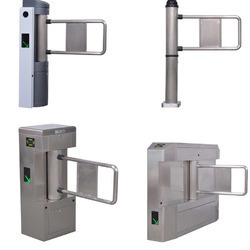 Speed Gate Our extensive experience has shown that the end users need security, but not at the cost where it creates a hindrance to the users. 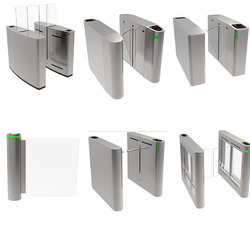 They need Speed Gate systems that can offer fast, secure and reliable access within the entrance area of their facility along with visually enhancing architecturally acceptable speed gate turnstile products that complement the buildings aesthetics. We are highly engaged to deliver the Flap Barrier Repair and Service. We are highly engaged to providing the Automatic Flab barrier services.